THE WRITING BUDDHA - Opinions | Books | Movies: HiFi in Bollywood by Rishi Vohra (Book Review-4.25*/5)!!! 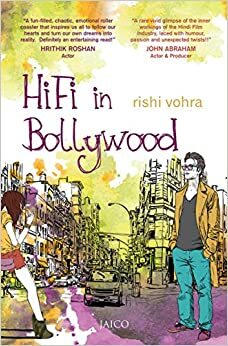 HiFi in Bollywood by Rishi Vohra (Book Review-4.25*/5)!!! I am just done reading Rishi Vohra's 2nd novel "HiFi in Bollywood". Unfortunately, I missed on the first one which was also a hit among masses who love reading urban stories. "HiFi in Bollywood"- the title suggests that it would be the same stuff that people write to narrate how actors sleep together to get better offers, how politics happen between stars, how movies become hits and finally the award is won and the actor senses maturity in the end. But fortunately and surprisingly, this book isn't about any of this. It describes how a boy who is been sent to Berkeley by his father to earn a degree in finance still dreams of becoming a director in Bollywood. Finally he skips his studies and moves to Mumbai without telling his father and starts struggling in Bollywood. This novel is about aspiration and the amount of hurdle one goes through in a city like Mumbai which looks systematic from far away but is too messy when you actually start dealing with it. The book is also about the tensed father-son relationship which is quite common in India where parents decide almost everything for the child till his marriage at the time of his birth itself. The child has no option of choosing any damn decision for himself. The book is very well written by Rishi Vohra in a language that you'll love reading it as fast as possible to know what's next. Rishi knows how to write a page-turner and it's quite evident from this attempt of his. He surely knows how to become favorite among the pulp fiction lovers. I am surely going to have his first book in my hands as soon as possible. I loved the way he build each and every character in the book even without wasting much time in describing their background and situation. That shows the amount of talent the author has. Story-wise, this book has a wonderful plot which will surely surprise you at times. Specially in second half and in pre-climax sections. I liked how Rishi Vohra have written certain things about the city without fearing anyone. There are few very well written scenes in the book. Specially the first day of Rayhan on a film set where the whole scenario of how an actor wants to sleep with an actress is narrated. Another great scene is when Rayhan is himself asked to direct the movie and he enters the set. Another great scene is when Rayhan's father is discussed drinking with his friends for the very first time. Such scenes definitely urges you to read more from this author for his brilliance which is quite evident in this book. The character of Peter will remain in my mind for a long time for how he changes his personality once Anil enters the plot. Haha! In all, I give this book 4.25* and will definitely recommend it to all.